BART Strike, not cute at all. The Bay Area Council, a public policy organization that advocates for business in the nine-county region, estimated the economic cost of the strike at $73 million each day in lost worker productivity. Currently, San Francisco’s Bay Area Rapid Transit (BART)— which is the nation’s fifth largest, used by more than 400,000 riders daily — and their workers are on a strike because their unions could not come to an agreement with management on a salary and other regulations. BART workers are demanding better safety measures and increased salary: 23% over four to five years. They have not had a raise in five years. Currently, the average salary ranges from $63,000 to over $70,000 per year for BART workers. Interesting note: it has been surprisingly hard to get an exact figure on salaries, or demands, or what the unions involved is actually saying, which in itself is deterring. This is the first strike since 1997. In the meantime, as someone living in Berkeley and having to cross a large body of water to get to work in the city, this is highly inconvenient. It is a nuance for the hundreds of thousands who take the BART, and for others whose commute via buses, ferries, and cars are interrupted. Yesterday, I took the AC Transit bus, which filled up quickly in Berkeley and no stops were made thereafter because it was packed (the conductor was not happy being flicked off by people on the stops). Today, I took the Casual Carpool route, in which you basically go to designated areas to wait for a car to pull up and take you to work. Yes, I relied on a random person to take me downtown, as did hundreds of desperate workers, interns, etc. around East Bay who are thinking more about getting to work than how they will eventually return. They’re already the top-paid transit system employees in the region and among the best in the nation. They have free pensions, health care coverage for the entire family for just $92 a month and the same sweet medical insurance deal when they retire after just five years on the job. They work only 37½ hours a week. They can call in sick during the workweek and then volunteer for overtime shifts on their days off. The rules exacerbate out-of-control overtime that in 2012 added an average 19 percent to base pay for station agents and 33 percent for train operators. The Negotiations class that I took at Cornell in the fall basically told be that there are a lot of bad negotiations going around in general. It gets especially difficult when you are discussing the public sector and unions are involved. This difficulty has historically been the case in the United States, in which union involvement always garners sticky situations. Strikes are the last thing that any involved parties should want; here, it is clear that the strike is not helping the BART unions at all in terms of public image. Given how difficult it has been for people to make alternative arrangements and that ridership on BART is expected to grow exponentially in the next decade, even as an outsider, I have to comment that a major upgrading needs to be done on this city’s public transportation. I watched Frances Ha yesterday in Berkeley, in one of those hipster cinemas with incredibly nice black reclining seats, which is fitting for a very hipster indie film (done in black and white with all the hipster clothing and glasses and artsy things, of course). As my close people know, I have issues with hipsterism and the irony of no irony. This is not about hipsters however, but more about how I really liked this movie. So much so that I am writing about it (and I never, ever review movies) and I want to watch it again (and I never, ever watch things by myself). Actually, this is not a movie review. Googling “Frances Ha” will show enough links to that (for example, here is one in the Washington Post and more here and here). 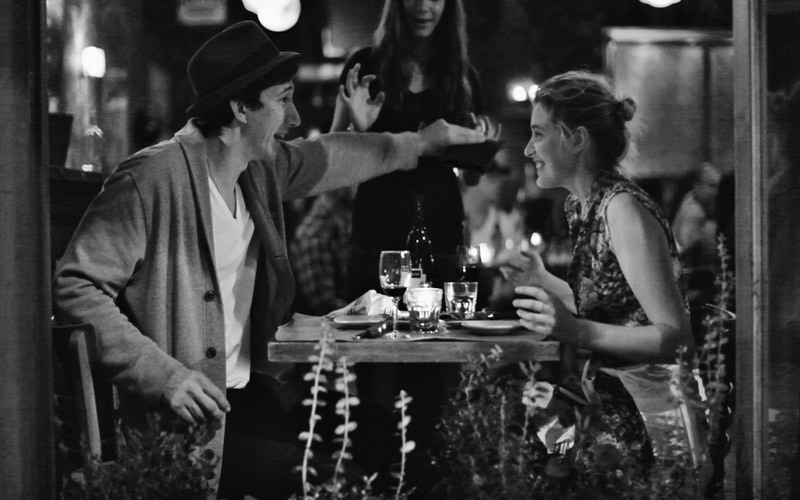 Frances Ha is basically like watching three episodes of Girls back to back. 20-something year old struggling women in the city with a degree they can’t sell and with sexual escapades made totally normal. They have witty lines that are not actually witty but things that we say all the time and the movie/series show us how silly/sad/funny/real “it all is”. They note the spiked nature of these liberal arts too-smart too-naive too-iwanttobedifferent types who have real problems: no money and too much pride to ask the parents, ignoring privileged backgrounds, and trying really hard to be Something. Frances is a dancer with no apartment in New York who is totally lovable and totally awkward, but not disillusioned (I was squirming during the dinner scene because I just felt so bad for her). She has her quirks and is completely unaware of how she comes off to the normal public, with her franticness, her stresses about making rent, her complete, platonic and real love for her best friend. She reminded me of how much I hate it when someone tells me to not be loud, especially by men. The dirty secret is that secretly none of this bothers her as much as she thinks it should, and her perpetual discomfort has more to do with the embarrassment of not being as shamelessly ambitious as her peers. Like all of Baumbach’s protagonists, Frances is stuck in a post adolescent twilight, reluctant to move onward and upward, but unlike those other sourpusses, she isn’t bitter; she just is, and when she finally gives herself permission to be weird, and happy and free, then inspiration flows like champagne, just as bubbly as she is. I was/am/can be frantic and hyper. I have calmed down a lot from before, mainly as a result of being told to do so. At a time when I am supposed to feel more and more like I should be myself, and be a liberated woman owning her agency, in the last few years I have had to “tame” myself to be more proper. It is only with some of my college friends that to this day, I feel the most comfortable making noises, saying inappropriate things, and being, loud. I don’t wish I was like Frances, with her free-spirited, completely unconscious behavior (thus making her “undatable” as repeated in the movie). You wish that you didn’t feel the need to not be like her. I do not believe that women can actually, in reality, be so free-spirited. This is why we watch these shows and movies, to be reminded and only reminded. Entertainment. Frances Ha also notes the love story of friendships, and the painful feeling of when you lose friends, when that feels like a part of yourself is lost. We undermine the pain of losing friends, since the separation is not a clear cut breakup but just happens. It is simply put, heartbreaking, because you are still connected as a result of not talking about it, and you will do anything to keep that connection, still. You admit that it is a terrible situation but you do not get bogged down on it, and you figure it out..or rather, let this new thing be normal. This might also be one of the meanings of growing up. I would not know. Oddly endearing. Now, I want a leather jacket and I want to take a whimsical trip to Paris with my new credit card being fully aware that it will put me in debt. Under George Washington, several Muslim Americans served in the Continental Army during the Revolutionary War. Bampett Muhammad, for example, fought for the “Virginia Line” between 1775 and 1783. History also denotes a man named Yusuf Ben Ali, referred to by his slave name Joseph Benhaley. Ben Ali was descended from North African Arabs and served as an aide to General Thomas Sumter in South Carolina. The presence of these Muslim Americans in several of Washington’s most defining moments suggests that Washington cared little for the religious makeup of his army and cared more for their devotion to freedom and independence. …these developments present a disturbingly novel spectacle: a maximally powerful force operating with a minimum of citizen engagement and comprehension. Technology and popular culture have intersected to perverse effect. While Vietnam brought home the wrenching realities of war via television, today’s wars make extensive use of computers and robots, giving some civilians the decidedly false impression that the grind and horror of combat are things of the past. The army’s grip is spreading across Sri Lankan society. Activists talk of a general effort to promote military culture among the young, especially among the ethnic Sinhalese majority… Skeptics say all this kind of stuff should be curbed. In the north and east, where the Tamil minority bore the brunt of war, the presence of military men breeds worry. No good reason exists for them to breed crocodiles, run school seminars, conduct whale-watching tours, or operate nurseries. The government retorts that it is better to use servicemen and -women for development than demob them. Their cheap labour, it argues, saved the country 1.5 billion rupees ($12m) last year. It is obvious that I have been a bit MIA in terms of updating this blog and allowing myself to address pertinent issues of our recent times (which there have been many). I do not want to make excuses but here it goes: graduate school. I have just completed my first semester at Cornell and it has been a ride, emotionally and physically. First of all let me say that I love(d) it. I loved being back in academic, forcing myself to understand complicated texts, analyze briefs, meet deadlines, and create presentations. I loved taking on new subjects (accounting? corporate law?) and at the end, doing well in the courses. I liked seeing the rewards of my hard work that only academia does in a certain way that nothing else can. Graduate school has been the best decision for me at this time. Being at Cornell after spending a good chunk of time abroad has also given me a new kind of culture shock that I did not face in Arizona over the summer. It is hard to explain and put a finger on it, but I hope to soon, one day. I also had to struggle with some life changes over the past four months that required a lot of energy and personal evaluation– a kind I have never had before and one I am still struggling with. You know how people say that you “grow” in new situations? I hope that whatever I am going through, is indeed, growth. Some of the obvious ambiguity aside, I hope that I can continue to contribute my thoughts here and use it as a venue to express myself. Newsweek‘s controversial cover this week features an article written by “well-known atheist activist” Ayaan Hirsi Ali, who asserts that this “rage” presented by Muslims in the Middle East and North Africa over the past two weeks “represent the mainstream of contemporary Islam.” Naturally, I have deep problems with this statement, being the product of non-raging Muslim immigrants in America who has worked pretty hard to stop people from making outlandish generalizations (read: this blog). Newsweek took me back to senior year at Wellesley when, for my Sociology seminar, I wrote about the deep Muslim immigrant divide from mainstream Netherlands, in relation to the murder of Theo Van Gogh. I disucssed Hirsi Ali who, a Somalian parliament member with van Gogh had created a controversial film, Submission, criticizing the representation of women in Islam. To backtrack: Submission was about a Muslim woman who is forced to marry an abusive man, then raped by her uncle, and then punished brutally for adultery. In one image, her body was shown naked through her transparent gown, with verses of the Qur’an painted across. Ali explained that the women chosen to act in the film were purposefully attractive so that the audience saw their beauty and vulnerability, and at the same time their dark body which signified race and sexual tension. Submission took advantage of the freedom of speech as a way to expose social taboos, the place of women in Islam, and the war on terror. I have some fundamental problems with Hirsi Ali, as well as others who like to categorize the experience of Muslims in a region to represent Muslims across the globe. The fact is, the brutal and sad story of Hirsi Ali is much rooted to her particular home and how Islam was interpreted within her culture and importantly, her family. Furthermore, the experience of Muslims in Egypt, Yemen, to Muslims in Somalia to Bangladesh, Turkey, London, to my current New York State is just, very, very different. The pockets of Muslim populations are large enough in New York to Arizona to the Netherlands and South Africa that indeed, we cannot categorize. We are talking about people who identify with a common religion implanted in very different cultures and histories. Suppose that we take this article’s title into value and assert that yes, all Muslims are just full of rage. I have found it particularly interesting that since its publication, it has succeeded in mockery. Yes, Muslims also know how to be funny (and yes, I just made a generalization). 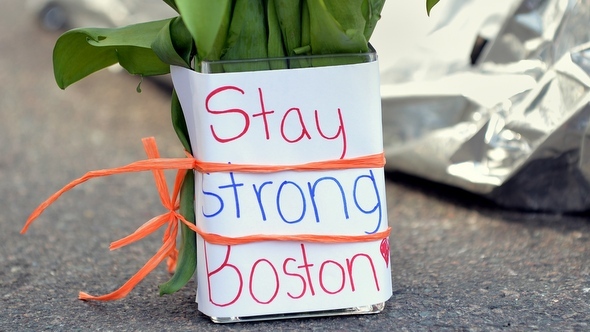 According to The Associated Press, “MuslimRage” was the sixth-most trending topic among U.S. Twitter users early Monday. It was at the top of that list in Pakistan and the United Arab Emirates. We keep saying let’s have a dialogue, let’s talk, let’s have a debate. Sure, that works. And then you have social media and a huge mockery of the whole “rage” that “Muslims”, supposedly, “everywhere” has, by the same Muslims that have been categorized to be raging. As much as these anti-American slogans and chants s by Egyptians, for example, could give readers the shock value that they want and further convince them of the story of hypersensitive Muslims, what this shows is also a not-so-convincing admission that not all Muslims actually think like this. No one bothers to ask, though, what other Muslims are thinking. Here is the thing–Muslims are raging. They are and have been raging and for the past decade, and no one has done anything about it. I have been a bit quiet since my last post, mainly due to obsessively watching the Olympics combined with preparing to move back to the East Coast, this time to upstate New York, in a ‘city’ I am slowly getting my hands on. Hello, Ithaca. Going back to the Olympics– This summer, I was quite pleased to see Phelps break more records, the female American Gymnastics Team light up the games (and media), and the emergence of a new star, Missy Franklin. Those are just a few of the stories of a very record-breaking-heartfelt-stories-filled Olympics. What I was particularly pleased about was the obvious observation of women making a big splash on the sports world. A simple fact: women won more (and I mean, way more) medals than their male counterparts in the US, China, and Russia, the leading countries in the London Olympics. These three large delegates also brought more women than men. Two thirds of the gold medals won by Team USA were won by women. Every national delegation had a female athlete on its team. In many of the sporting events, women fared better then the men (US Women’s soccer, anyone?). Female athletes helped Britain achieve its best medal tally since 1908. Women simply won disproportionately more medals then men. There were no female competitors when the modern Olympics started in 1896. When Saina Nehwal returned to her home, India, after winning the bronze medal in badminton, the ovation and euphoria received from fans was comparable to the kind usually reserved for their all-male cricket team. The statistics and facts go on. While women’s professional sports still get less media attention, let alone viewers and audience interest, in an event like the Olympics, it does not take a lot of analysis to see that they are not doing so bad these days. Of course, some things still come later than they should when we talk about gender equality. Saudi Arabia, Brunei and Qatar (finally) let women compete on their Olympic teams for the first time. And speaking of sports, the Augusta National Golf Club has decided to “stop embarrassing itself and move into the mid-20th century” by admitting two women as members (New York Times). The members are no other than former Secretary of State Condoleezza Rice and Darla Moore, a business executive. As Andrew Rosenthal of NYT put it, there is not excuse for the right thing to take place a few generations too late. With this dramatic London Olympics, I really cannot wait to see what’s next for women, and for underrepresented women in Rio. Recently, I received an email from the career services at Cornell instructing me to bring formal, ‘business’ clothing to campus for graduate school. A graduate of a liberal arts college, let alone an all-women’s New England institution, you are likely to have a few business clothing here and there. We did get J. Crew to name a cardigan after us. I have never been completely comfortable wearing formal, business-y clothing. I have never worn a suit. I don’t like suits on women, except Jennifer Aniston. I love blazers, and I consider pairing dark skinny jeans with a nice top as formal (…as I will go). This time, I have been specifically instructed to purchase proper business clothing and this particular message has been in my head for two weeks now. A specific email from a specific department not asking, but telling me to do something non-academic-financial aid-housing-orientation related. I am actually going to be wearing formal clothing in a space that is all too natural to be formal. It will matter what I look like, but more will be judged on how professional I look rather than if I actually look good (which can happen, formal or no formal clothing). Perhaps I am making this into a bigger deal than it is because it feels like a wake up call to adulthood or perhaps a reminder of my reality–grow up, and get a suit, wear it and embrace it, and no, you can’t get away with things that are imaginary-formal. Things are happening, way, way too fast. Also, I did purchase a suit and cannot wait to wear the coat-blazer part without the head to toe one color deal that suits force me to do. Inkhosikati LaMbikiza doing it right. I had to share this photo of Inkhosikati LaMbikiza, the Queen of Swaziland, or at least the ‘queen’ that comes to public light the mos tout of King Mswati III’s wives. She has some serious style, and as someone who loves bright colors, I was excited to wake up and see this on the front page of the Huffington Post. 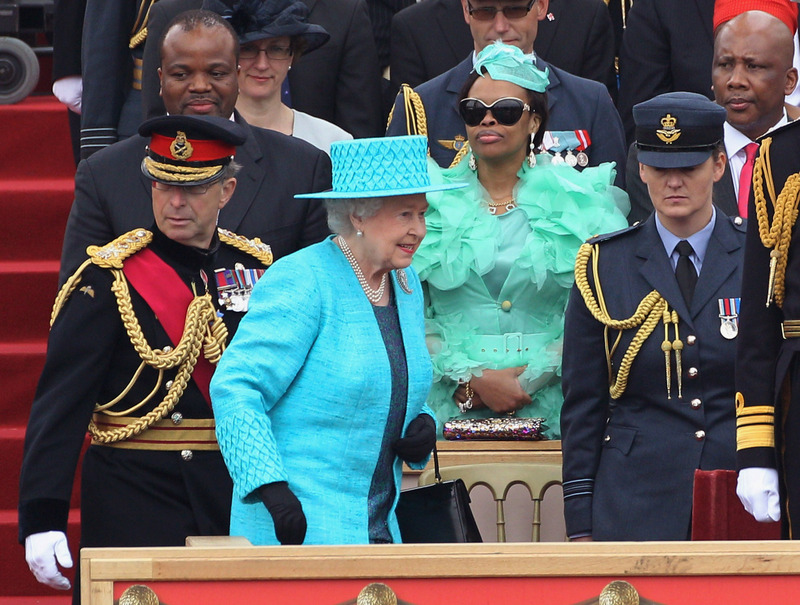 Queen Elizabeth II is not bad herself, but at the Armed Forces Parade and Muster in Home Park (May 19, 2012 in Windsor, England), Inkhosikati LaMbikiza’s “teal confection with layers of 3-D flowers, a matching fascinator and some baller cat eye sunglasses” is, respect. Mr. Dorson was energetic and simply put, amazing. The last time I saw him was at the airport, on one of my visits home from Wellesley College. He saw me from far, and in his quirky mannerism, dropped his bag tot he floor, opened his mouth wide and wobbled over to me to give me a big hug. He asked me how I was and said that he was proud of me. To read about Mr. Dorson, click here.